Medical Illustrations Copyright © 2018 Nucleus Medical Media, All rights reserved. Used in the treatment of GERD or Gatro Esophageal Reflux Disease to treat patients who suffer from acid reflux. Weight loss surgery, also known as bariatric surgery, refers to procedures performed on the stomach and intestinese to change the way food is consumed and absorbed. 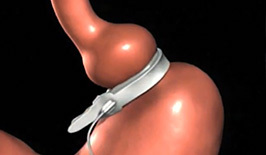 Laparoscopic minimally invasive procedure for the treatment of gall stones and gall bladder polyps. Dr Jordaan performs both laparoscopic and open repair of inguinal, umbilical, epigastric, ventral and hiatus hernia. Endoscopy is a day procedure used to investigate causes for gastro-intestinal problems that can be found in the oesophagus, stomach and duodenum. Dr Jordaan specialises in Laparoscopic, Gastrointestinal & Endoscopy and Weight Loss Surgery. At Jordaan Surgical we pride ourselves on providing our patients with the highest level of medical care in both the pre and post-operative phases. Dr Jordaan studied and received his formal qualification from the College of Medicine in South Africa. After relocating to Australia he worked in both the public and private sector. He then opened his private practice in the Pindara Hospital Specialist Suites and operates at both Pindara and Allamanda Private Hospitals on the Gold Coast. Dr Jordaan performs minimally invasive surgery for a range of health issues including gallstones, hernias, thyroid problems, reflux disease and bowel cancer. He also has a passion for laparoscopic bariatric surgery for the treatment of weight management and morbid obesity. Head to our surgical weight loss site www.surgicalweightlosscentre.com.au for more information. You can make an appointment with us online by completing the form below and we will call you to confirm your appointment. Please specify dates and times you are available or alternatively when the appointment is required. © 2019 Jordaan Surgical. All Rights Reserved.